Now a scale that you can use to measure large amounts of hops and grains at home! This is a great addition to any home brewery! This Electronic Grain Scale is capable of weighing a full sack of grain, and then some. This benchtop unit has a 55lb capacity, lifetime warranty, and a host of helpful features. Cheaper than less capacity options on Amazon! So I can weigh hops, grain, and other chemicals. The small scale we have right now can't handle the weight of grain. This should do it! Going to be milling my own grains and this looked like a good solution. Works great! The product is accurate and I love how the screen dismounts from the scale of you are measuring a large object like a sack of grain. Super easy to use, and very accurate. A standard 5 gallon bucket fits on it for holding the grains you're measuring. I like the simple straightforward way it works. I've had one of these for a couple/three years. Best scale out there, IMO. The price is fair, the quality is terrific. When it went on sale, how could I not buy one for my son, who also brews? In use in our 2BBL brewhouse and has held up to a lot of abuse in the past 12+ months...including an incident of getting completely submerged in water. I have one personally, as well as one in our commercial kitchen. from a few ounces to 55lbs, this is a great scale to have around. Big display and ease of use. Love il! Awesome scale, 4 stars & not 5 because I think it shuts off too quickly. Great product. Simple to use, easy to switch between lbs, oz, etc. with a button on the side. Added the power adapter and keep this on my island in the kitchen when I'm not using it in the brewery. Very functional and useful. This works great, love the lit screen. I bought this scale to weigh the grain bill for 10 gallon batches. The practice of using a bathroom scale with me and the bucket left a lot to be desired. My high accuracy scale did not have the capacity I needed. This scale is convenient with the removable display face and the accuracy is good even down in the ounce and gram range. Highly recommend! zeroed very fast. poured the grain into the bucket and the read out was easy. 53 lbs. of grain done and in the mill in no time. Work's great, I put a 2gal bucket on it to weigh out the grains. Doesnt come with a power cord. Batteries only. Works well on both ends of the scale, accurate on large malt sizes and small hop ounces as well. I am actually afraid to put a 55 lb grain bag on it because of the flimsy design. Also, it shuts itself off within a few seconds, and then takes a while to turn back on and tare. It does non come with AC/DC adapter. Great scale for weighing bulk grain. Get the exact amount of grain that your reciept calls for. Place a bucket on the scale and tare out the weight and fill with the grain that you need. Works great! Pros: weighs everything from hops to grain in a very accurate fashion. Having the readout on a remote cable is very handy when you have a large tub of something and still want to see the readout. Cons: I would pay double if they could insulate the unit. DO NOT get this wet or it dies. This is a huge disadvantage for a brewing location when splashes, etc. happen all the time. Went through multiple units before going to a different solution. But I still prefer the operation of this unit better. love it. would recommend to purchase. works great, zero issues. This is the same scale MoreBeer uses in their show rooms, and is great! The ability to remove the electronic readout is extremely helpful for larger readings. Automatic shutoff keeps battery life up. It is as accurate as most any home brewer may ever need! 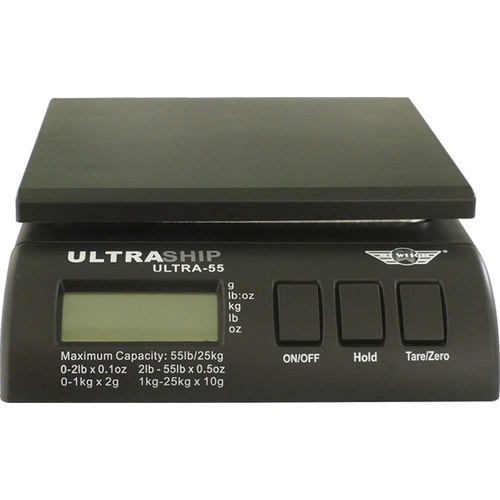 Great working scale, not sure what you need other than it weighs correctly and down to smaller amounts and conversions accurately (grams specifically). The one bad thing, you need 4 "C" batteries (not included), which it seems like no one uses anymore and they aren't very cheap. The battery compartment and/or box doesn't even say what size battery it needs which is also a little strange. It has a plug for an AC adapter, but one doesn't come with the product and good luck finding the right one from a 3rd party that's affordable.. I found no issues and use this for my brewery. So far so good! Nice Scale for the right price! As far as scales for go for weighing out large amounts of grain this one does the job. I wish the plate size was bigger to fully fit a bucket on top of the square plate, but a Brew Bucket or Home Depot bucket fits over the square plate and sits on the scale just fine and the detachable face plate comes in handy at this point as well. Also great for weighing Kegs when filling them if you pre-fluch them with CO2 and pressure fill from a conical fermenter to the keg. I just leave them on the scale tell they reach about 47.7-48 lbs. with the keg's weight and I know I have a full fresh keg of beer! It is an excellent price! After installing new batteries and turning it on I had error # 5 ? Manual has no # 5, weight will not stabilize for any weight. will not calibrate.